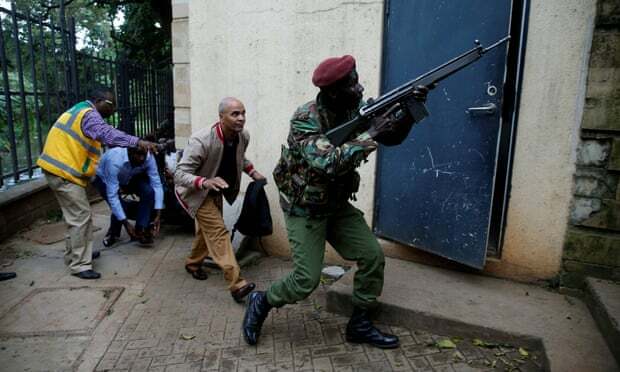 Gunmen blasted into the DusitD2 luxury hotel and office complex in the Kenyan capital on Tuesday killing 14 people, including an American citizen, according to local media reports. The attack was claimed by Somali based Islamist militant group Al Shabaab. Though Kenyan officials claimed that the incident was over and under control, gunfire and explosions were still heard more than 16 hours since the assault. The shots began at around 3:30 a.m. local time and 150 workers was escorted from a building where they had sought refuge. Kenyan police chief Joseph Boinnet said the attack began with a car bombing that targeted three vehicles, and a suicide bombing in a hotel foyer which left a number of guests with “severe injuries”. Following the attack, people ran out of the complex and climbed out of windows to escape, while other office workers said they had to leave colleagues behind hiding under their desks. Al Shabaab claims that its attacks are revenge for Kenyan troops stationed inside Somalia, which has been riven by civil war since 1991.